ES was reacting off daily S2 ... and still have in mind Monday's run up and a bit of a run up that I had SPY calls for as a day (or more) trade that I covered each day (option day trade on SPY). I still see potential of 926-923 today ... but, again, the pm in recent days has run up off of any lows ... was looking for more of a precipitous fall/plummet in price. Will hopefully make some on the 2nd half of position ... may even peel out of half of that around 926 and hold a quarter of initial position. 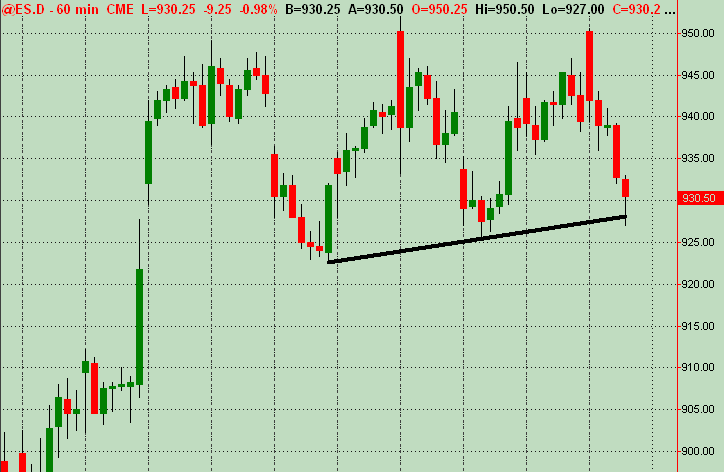 Another reason I covered ... 60min chart got down to where a potential H&S neckline (trendline) was in the 929 price area. Out of rest of put position with ES trading at 931.
could be considered a triple top ... espec considering the highs overnight. Then again, we're in a trading range, albeit only a week+ on the Daily, and traded down to the low end conciding with the 920's. Just more observations. Nice call Kool ... much appreciated!! 33 - 35 is the break down point so this is what us sellers want to see hold now on this push up..